SCVHistory.com JB4001b | San Francisquito Canyon | Artifact: Newhall Dairy Farms Milk Bottle, ~1940s. 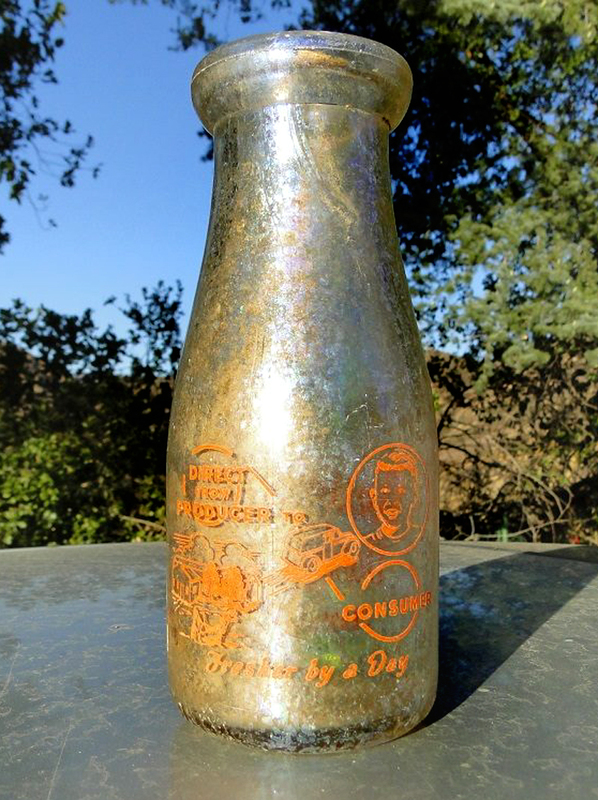 October 15, 2013 — Newhall Dairy Farms milk bottle, found under a house near LADWP's Power House No. 1 in San Francisquito Canyon on this date by photo contributor Jason Brice. Clear glass, 6.5 inches, probably 1940s. Front reads: Newhall / Dairy Farms / Newhall Calif.
Back reads: Direct from Producer to Consumer / Fresher by a Day. Molded into the glass around the bottom: 1/3 quart / For cafe use only. JB4001b: 19200 dpi jpeg by Jason Brice.